Student groups on Sunshine State excursion won’t want to miss a trip to the historic city of St. Augustine, the site of the oldest navigational aid in the United States. 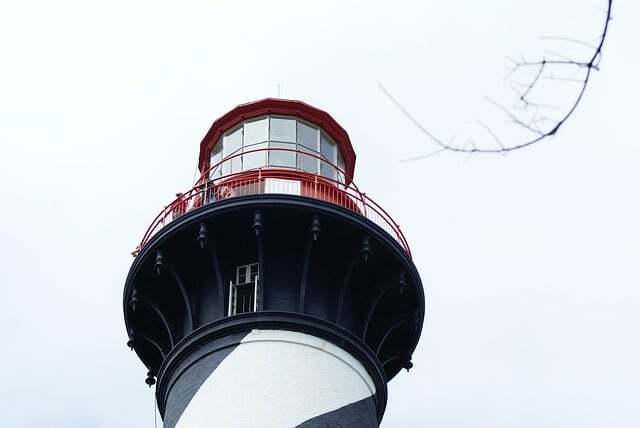 The original lighthouse, a Spanish watchtower, was converted into Florida’s first in 1824. A second was completed in 1874 to replace its predecessor, lost to the sea after a long battle with erosion in 1880. Constructed of Alabama brick and Philadelphia iron, the candy-striped tower rises 165 magnificent feet above sea level and contains 219 steps; its enormous lens consists of 370 hand-cut glass prisms arranged in a beehive shape 12 feet tall and six feet wide. Visitors are invited on self-guided tours of the Lighthouse, Museum and Shipyard Playground, with an array of fun and informative guided tours offered to enhance an already fascinating experience. Trudge your way to the top and enjoy breathtaking 360 degree views of St. Augustine, St. Augustine Beach, the Intracoastal Waterway and the Atlantic Ocean as your reward; be regaled with local legend and lore – stories of sailors, light keepers and fishermen who’ve shaped and guarded the coast of Florida for more than 500 years. Discover centuries of maritime history and trivia as you marvel the museum’s three stories of educational exhibits and authentic artifacts, many hauled up from the sites of old shipwrecks.